We’re expecting an Apple event sometime in October where we’ll get to see the new iPad 5 and iPad Mini 2. However, if you are as impatient as we are you’ll be pleased to know that images and hands on videos of the anticipated next-gen iPads have already leaked out. 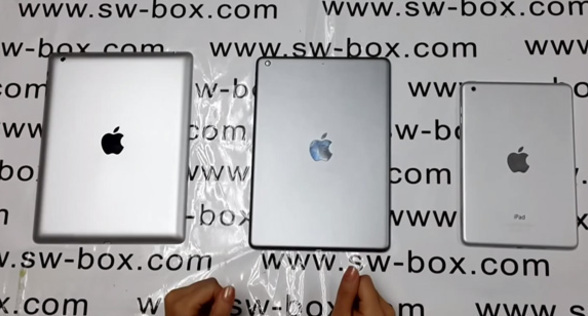 The iPad 5 leaked images and video appear to show just the aluminium back panels of the new iPads but do also reveal that the iPad 5 will be smaller, thinner and lighter than the iPad 4 and seems to be a slightly different form fact too. The iPad Mini 2 appears to be pretty much the same size and shape as the existing mini so expect all the changes to be on the inside! Both the iPad 5 and iPad Mini 2 are expected to feature the same fingerprint scanner as featured on the new iPhone 5s as well as updated cameras but neither appears to reveal a built-in flash. The hope from us us that we’ll see a retina display on the iPad Mini 2 as well as improved battery life and CPU performance on both models. I suspect that both will have the new A7 chip in there too. So check out the video from SW-BOX.COM below and see if that give you an appetite for some new Apple tablet goodness!